What seemed like a typical takeoff turned into a near-tragic disaster Saturday night in Denver. However, as passengers witnessed their plane burst into flames after it crashed on the runway, the scene inside the cabin remained calm, according to a survivor. "For some reason, I just didn't believe it was happening," 22-year-old Kristina Beagle told CBS' The Early Show. "I was just kind of going with the moment. Everything just sounded a lot quieter. I just felt a glow on my right side. That was the only light I had in the entire cabin and I felt the warmth. I didn't smell anything right away yet. I just heard someone yell, 'It's on fire! Get out!' We all just left." Federal investigators Monday will examine the burned remains of the Continental Airlines jet. The so-called black boxes have been recovered and the National Transportation Safety Board said it appeared the flight data and cockpit voice recorders are in good condition. Firefighters said it was a miracle that no one was killed in the fiery crash, although 38 people were injured. Beagle, who was in Colorado celebrating her college graduation with a ski trip, described the scene inside the plane afterwards: "You think it would actually have been chaotic but people were actually reasonably calm. Everyone got out in an orderly fashion. I thought about my phone for some reason but I wasn't bothering to look for it. We all pushed through. People were pushing to get in the back. They did such a great job of opening the emergency exits right away." During takeoff, the plane veered off the runway, skidding to a rest in a 40-foot deep ravine. Both main landing gears were sheared off, and one of the plane's two engines was disconnected from its wing. Beagle recalled thinking the plane took a really hard turn. "I've flown many, many times. I was like, this feels really unusual. All of a sudden we're off the runway and jetting around and it didn't hit me. It felt so surreal. It was like we were in a movie. People were screaming and once I heard the people scream, I realized, oh, my gosh, we're crashing," Beagle said. Beagle said it felt as if the plane were momentarily airborne. "It felt like it; I'm not actually sure if it was. We went over [what] one of the firefighters told me [was] a 50-foot snow bank and we fell down - we were in the air for a little bit, I don't know how high, and slammed down. The 115 passengers and crew aboard fled through emergency exits and down chutes as the plane burned. Because of the flames on the right side of the plane, only the left-side exits were open. "People were slipping on the wing because of the jet fuel, because the engine was gone," Beagle said. She remarked that there were lots of children on the flight. "I've never seen so many kids on a plane, to be quite honest, and it really stinks that they were on this flight." Just minutes after escaping the crash, passenger Mike Wilson of Denver posted updates from the scene on Twitter.com using his cell phone. "By the time the plane stopped we were burning pretty well and I think I could feel the heat even through the bulkhead and window," he wrote ( Read more of his posts here). 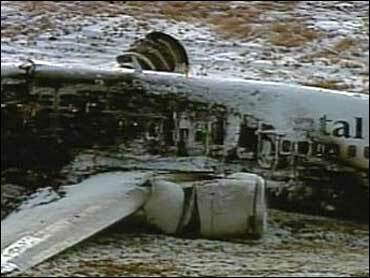 The resulting fire scorched the entire right side of the Boeing 737-500. The fuselage cracked and the interior burned; melted plastic from overhead compartments dripped onto the seats. Some speculate (as reported in The Wall Street Journal) that there might have been some sort of braking problem. How would that have come into play? "Well, the pilots make a decision to abort their takeoff, they back the engines down and stand on the brakes," aviation expert Peter Goelz, former managing director of NTSB, told CBS Early Show anchor Harry Smith. "If the brakes were applied for some reason unevenly, you know, if there was some malfunction, that could have veered the plane off, or it could have been uneven engine power - [for example] when they back the engines down, one engine kept going." The speed at which pilots must decide whether to abort takeoff (V1, or about 130-140 knots), comes about 4,500 to 5,000 feet down the runway. "There's plenty of room," said Goelz, as Denver's runway was 12,000 feet long. "Pilots are trained for aborted takeoffs, you know, throughout their career. And this plane could take off with one engine, without any problems." CBS station KCNC-TV correspondent Rick Sallinger reports that NTSB investigators will interview the Continental flight crew and passengers, examine the windy weather at the time of the accident, and measure the very visible skid marks. The two "black box" flight data and cockpit voice recorders were recovered and sent for examination to Washington, D.C. It appeared both were in good condition, the NTSB said Sunday. They are seeking clues as to why Flight 1404 came to a jolting and fiery end Saturday night en route from Denver to Houston. NTSB Board Member Robert Sumwalt told CBS News that investigators are looking at "possible engine anomalies, braking problems, meteorological conditions, and pilot issues," but that, "at this time, we don't have a leading focus. Everything is on the table." Sumwalt added, "There is no indication whatsoever that they [braking problems or engine problems] were a factor." He also noted, as has been previously reported, that "the runway was bare", that is free of snow or ice, at the time of the takeoff, and that "the wind was blowing fairly hard out of the west." The weather was clear but cold when the plane attempted to take off for Houston around 6:20 p.m. Saturday. Winds at the airport were 31 mph, the Federal Aviation Administration said - not unusual for Denver Airport. The runways are elevated, so rain and snow will drain away. "It is fortunate that injuries were not worse and that there were no fatalities", Sumwalt said. "If things were different, it could have been a catastrophic fireball."